Well clubber my lang, it’s more Rocky figures! Over the next few weeks, we’re going to be unveiling a bunch of new Toys ‘R’ Us Exclusive action figures and items, and we’re starting with a classic. The Rocky vs. Apollo 2-Pack lets you reenact one of cinema’s most legendary battles from the original Rocky movie! These special edition figures aside from being packaged together utilize the new flesh tone technique we have implemented into some of our current offerings. Presently our Rocky Series 2 and Series 3 use the translucent flesh technique however the original release of Rocky and Apollo in Rocky Series 1 did not. 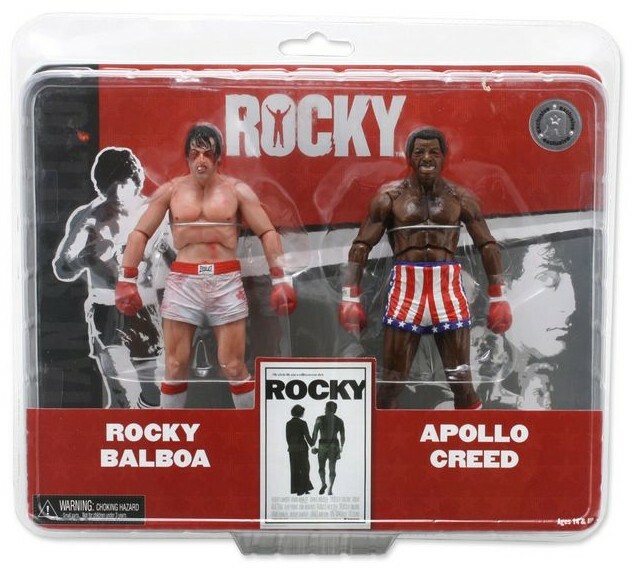 This exclusive set gives collectors a chance to purchase a Rocky and Apollo that match Drago and Clubber along with the Rocky IV and Rocky III versions of Rocky. It also provides a second chance for those who missed out on Series 1 which sold out quicker than anyone anticipated. Both figures are fully poseable, highly detailed, and in clamshell packaging featuring the original movie poster design. Stay tuned over the next couple weeks for more Toys ‘R’ Us Exclusives to come. Not to give away any state secrets or anything, but suffice it to say we’re going to be getting in gear shortly on our next big reveal. Okay, I guess that was pretty obvious. Still, stick around. It’ll be fun. For more on Rocky, check out our recently-shipped Rocky Series 2 7″ action figures, which not only has the Battle Damaged Rocky, but Pre-Fight Drago and Battle Damaged Drago as well from Rocky IV! And don’t forget to let us know what you think of the Rocky vs. Apollo Toys ‘R’ Us Exclusive 2-Pack and all the upcoming TRU Exclusives by hitting us up on Twitter, on the Official NECA Facebook or on Google Plus. As ever, we’ll be here on the NECABlog too, bringing you the latest news and updates on all your favorite games, movies and more!